As part of our Near Neighbhours Project, Sneinton Alchemy is proud to support the event. 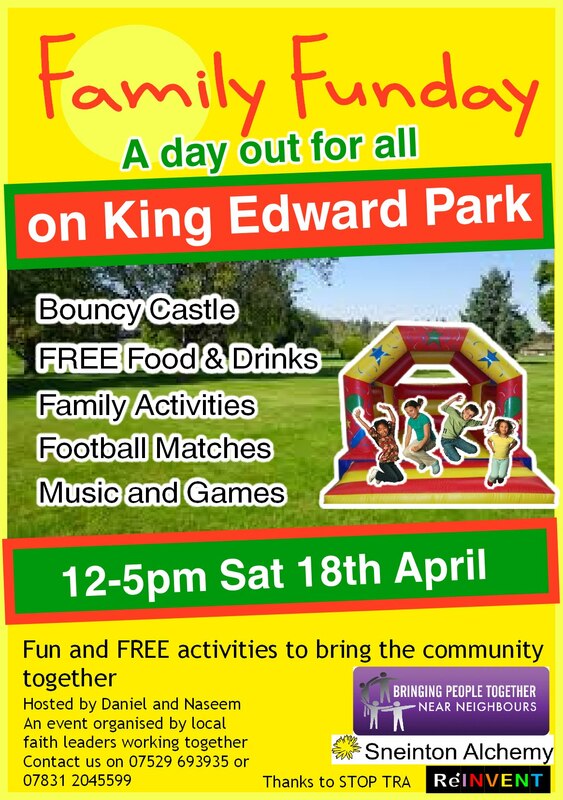 The lovely local King Edwards park will be the venue for a fun community-focussed event with loads of family friendly fun activities and games. Local residents Daniel and Naseem will be hosting the event and helping to supply wonderful food free to all (it can't last forever, so it's first come first served...). A family funday was the brainchild of local faith leaders who were brought together by the the Near Neighbours project; they identified this as the best way to bring people together socially from across the community. The project aims to help unlock some of the area's potential by bringing people together to work on celebrating Sneinton's good points and working to heal some of its problems. Community Organisers David and Shabana are working on this. Their aim is to support people to take action on issues they care about. The action will happen in ways that people, using their local knowledge and skills, consider will be the most effective. Find out more about the Near Neighbours Project and how to get involved. For more information on the Family Fun Day or get involved, please contact Daniel or Naseem (see poster for details). Thanks to STOP Tenants & Residents Association for use of their cafe too!